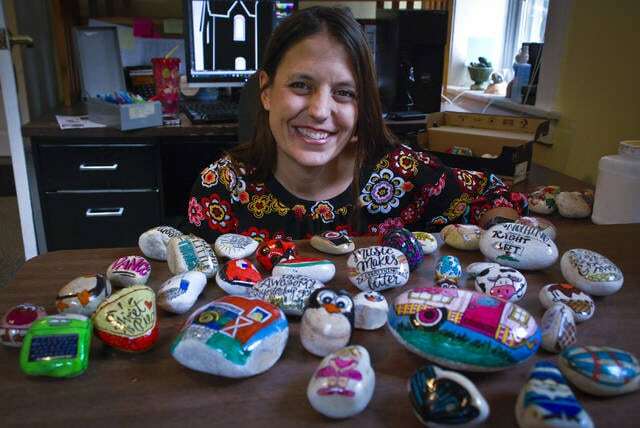 Painting a hundred rocks a week with characters and sayings is a task of joy for local artist Sara Deericks because when the rocks are found faces light up. The only goal of local artist Sara Deericks is to brighten somebody’s day and make them smile. Deericks paints characters and sayings on rocks and leaves them around Delaware for people to find. While on vacation in North Carolina, Deericks was inspired when she saw a rock that said “relax.” Once she returned home to Delaware, she picked up some rocks and started painting. “I thought it would be a fun way to make people smile,” she said. Deericks said she likes flat smooth riverbed rocks because they’re the easiest to paint. However, she really doesn’t need to forage for rocks on her own, they seem to come to her. She said that one of her birthday presents was a bag of rocks. Deericks’ idea of making people smile has become a creative work for her because every rock’s shape is unique. She finds new inspiration every time she paints. She held up another that she thought looked like a snail and then one that looked like a lady bug. Deericks loves seeing the smiles on faces of people who find her little creations unexpectedly. She is the graphics coordinator at the Arts Castle on West Winter Street. On her way into the office, she will place a rock near the entrance. Deericks said she probably paints a hundred rocks a week. “Every one is different,” she said. She has also painted theme rocks. Deericks said when children find them they “scream and screech.” She said their parents will tell them to put the rocks back where they found them until they realize they can take them. On the back of every rock Deericks places a sticker for Instagram, Facebook and Twitter. Deericks said the other day her son commented about how happy she is when she’s painting the rocks. “He said that it’s like my coffee because when I paint a rock I get really happy like other people do with coffee,” she said. Deericks said she is now giving rocks to members of her family to hide. She said they don’t hide all the rocks she gives them because they find ones they like and tend to keep them. This entry was tagged Arts Castle, delaware, ohio, Rock Art. Bookmark the permalink.